It’s really pretty incredible that after almost 20 years, the influence of the UK Garage genre is still very present. From its early incarnations around 1994, British Garage has had a huge impact over urban music in the UK from people like Dizzee Rascal, MJ Cole, The Streets, Ms Dynamite. It has achieved both commercial and underground success. The UK Garage family tree of sub-genres is an absolutely fascinating piece of music history. In 20 years it has created / influenced : 2step, Speed Garage, Dubstep, Bassline, Grime, UK Funky and countless others. It is still being felt in the present underground music landscape with the new wave of artists like Jacques Greene, Disclosure, CRST, Falty DL, Burial, Preditah and tons of others all paying homage to the roots of UKG. 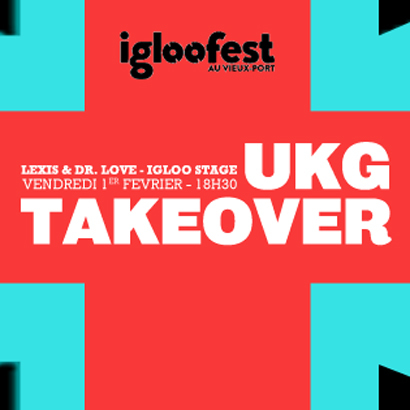 Presented as part of the world famous Montreal Igloofest festival, “UKG Takeover” will be a tribute to the 20 year history of the genre and the DJ’s will be Lexis (founder of MusicIsMySanctuary.com) and Dr.Love, two of America’s earliest UK Garage DJ’s.